All eyes are on the condo market as new mortgage regulations kicked in beginning in January. The reality is most buyers are on locked into rate holds for 120 days so the true impacts of the new rules likely won’t be felt until much later this year. If you read last months condo report you may have noticed some panic buying in December as buyers rushed to secure properties prior to the New Year. January appears to be more of the same, with record low inventory levels, desperate buyers, and bidding wars pushing prices higher. Vancouver condo sales increased by 8% on a year over year basis and remain surprisingly robust despite continued policies aimed at cooling the market. For the month of January condo sales were 3% above the 10 year average. 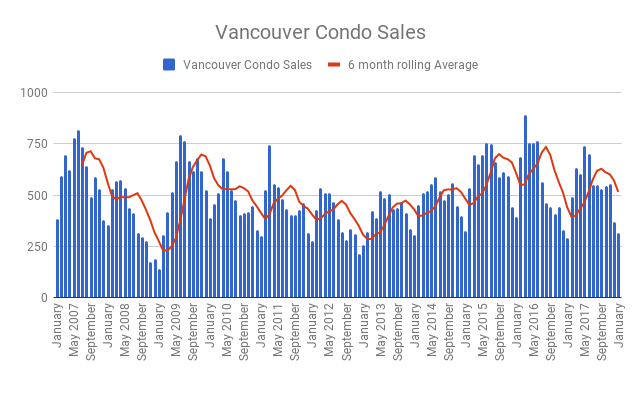 Vancouver condo sales using a 6 month moving average appear to be slowing after peaking in early 2016. Vancouver has been unable to solve the mysterious case of new listings, which hit a decade low in January. New listings plummeted 9% year over year and were a staggering 30% below the ten year average for the month of January. 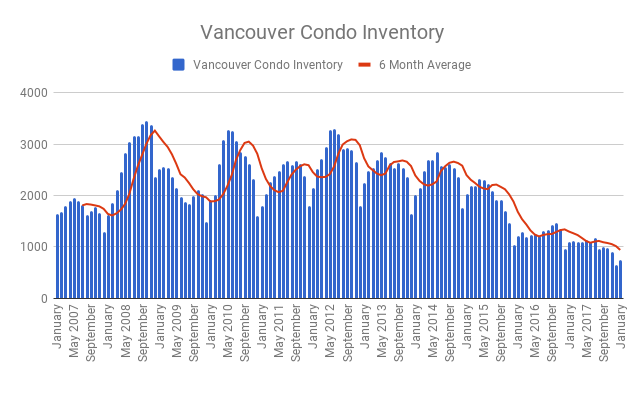 Vancouver inventory levels plunged 32% year over year in January. Although they increased slightly from record lows in December. The sales to actives ratio was 42% in January, indicative of a sellers market with upwards pressure on prices. 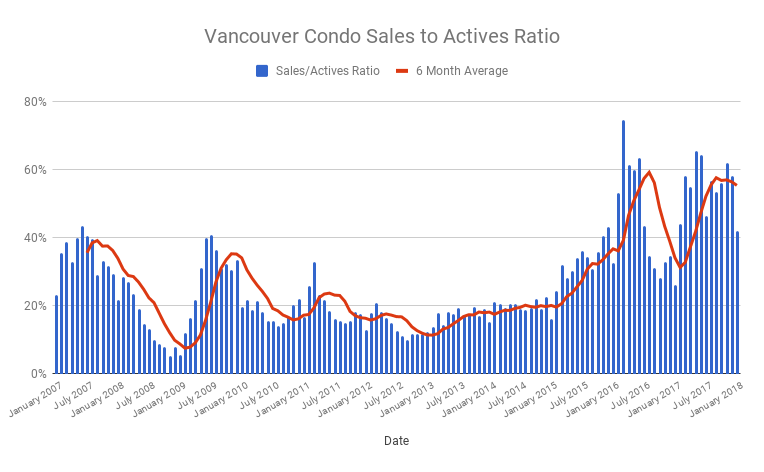 Vancouver condo sales to actives ratio. The average sales price spiked upwards in January to $1,090,317. This is partly due to some high end luxury condos selling and skewing it upwards, but nonetheless the trajectory continues to be upwards. The median sales price was $794,000 a 28% increase year over year. The average price per square foot also hit a new high of $1124. While Vancouver condo price growth has slowed in recent months, it saw a surprising spike upwards in January. This suggests a potential reaction to the new mortgage changes which has many buyers scrambling to secure something before rate holds expire. With inventory levels near record lows and sales remaining strong there continues to be upwards pressure on prices. While this is clearly unsustainable in the long term, short term dynamics suggest little relief for buyers in the coming months. Expect bidding wars to continue as too many buyers chase too little inventory.